Ex-congressman Ed Case defeated candidate Lt. Gov. Doug Chin, who was the architect of Hawaii's legal battle against Trump's travel ban. HONOLULU — Former congressman Ed Case emerged from a crowded field on Saturday to win the Democratic Party primary to represent Honolulu in Congress. The 65-year-old fiscal conservative defeated five other major candidates including Lt. Gov. Doug Chin, who was the architect of Hawaii's legal battle against President Donald Trump's travel ban. Case said his message that politicians in Washington need to work together resonated with voters. "I think voters want Washington to work again, that's the number one issue. Clearly that was my message and I think that accounts for much of the result of my race," Case said after he was declared the victor. Case served in Congress from 2002 to 2007, giving him an edge in experience and name recognition. He ran unsuccessfully for the Senate and House in the years since he left Congress, then retired from politics five years ago to become an executive for a Hawaii-based hotel chain. Case said he returned to politics because the government wasn't functioning and he believes he can help. He will face Cam Cavasso, a former state representative who previously ran unsuccessfully for U.S. Senate, in the general election. Cavasso won the GOP primary Saturday night. 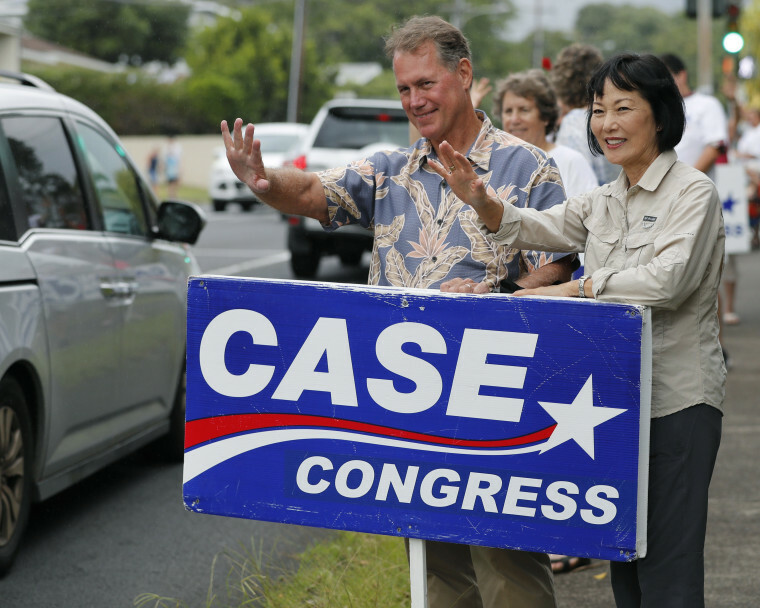 Case will have an enormous advantage in the general election, given the Democratic Party dominates politics in Hawaii. Case said it's humbling to know that he gained the trust and confidence of so many voters. He expressed admiration for his opponents in the primary, adding he would reach out to those who didn't vote for him and ask for their support in the general election. Other contenders were 29-year-old Kaniela Ing, a democratic socialist who hoped to follow in the footsteps of colleague Alexandria Ocasio-Cortez of New York to score an upset victory. On Thursday, Ocasio-Cortez stumped for Ing in Honolulu. The candidates spanned the political spectrum of Hawaii's Democratic Party. Case represented the conservative end, expressing concern about the federal debt and deficits. He was a member of the Blue Dog Democrat caucus during his last stint in Congress. Ing stood for the progressive wing. Ing and fellow candidate Beth Fukumoto, a 35-year-old former Republican and outspoken Trump critic, frequently spoke about the punishingly high cost of living on the islands and the need for reforms to help young people afford to stay in the state. According to the U.S. Census Bureau, 47 percent of Hawaii's residents spend more than a third of their monthly income on rent. That's greater than any other state. About one-quarter of renters put half of their income toward housing. The race attracted so many candidates because the incumbent, U.S. Rep. Colleen Hanabusa decided to challenge Gov. David Ige in the gubernatorial primary instead of run for re-election. She lost to Ige. Sonia Lee-Gushi, who works in the health care industry and lives in Honolulu, said she thought Case deserved a second chance in Washington. She also disagreed with the candidates who focused on how they would oppose Trump. "I feel like they're just trying to get the vote of those who don't like Trump, which is not necessarily how we want to choose our leaders going forward," she said. The winner of the general election will join a four-person Congressional delegation in Washington, D.C. In Hawaii's other congressional district, U.S. Rep. Tulsi Gabbard, a Democrat, easily won the party's nomination to represent rural Oahu and the neighboring islands. One of her challengers, Sherry Alu Campagna, criticized Gabbard for refusing to participate in debates even though she's argued in the past that candidates should debate to present their positions and be held accountable for their opinions. She'll face Brian Evans, who ran unopposed in the Republican primary.